Caltex signs another multi-year sponsorship agreement for Caltex League and Knockout | Welcome to Chevron Lubricant Lanka PLC. On the 23rd of February 2011 the Company announced that it renewed the sponsorship agreement for three more years with the rugby union, making it one of the longest sports partnerships in the history of Sri Lanka. With the extension of the rugby sponsorship, Caltex makes history with 14 years of rugby sponsorship in Sri Lanka. As the Official sponsor of the League and Clifford Cup, the company has invested over Rs.400 million to develop the game of Rugby in the country over the past eleven years, reiterating its commitment to take the interclub 'A' Division rugby tournaments to the next level. 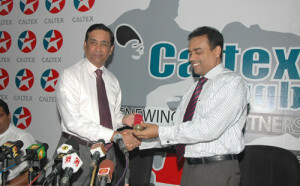 Caltex has played the role model of a true corporate citizen, honouring their commitment for Sri Lanka rugby.